The Koch Brothers are realigning and retreating from national electoral politics. The Koch family controls the second-largest privately owned company in the United States with the latest revenue reports reflecting $115 billion for 2013 according to Forbes. 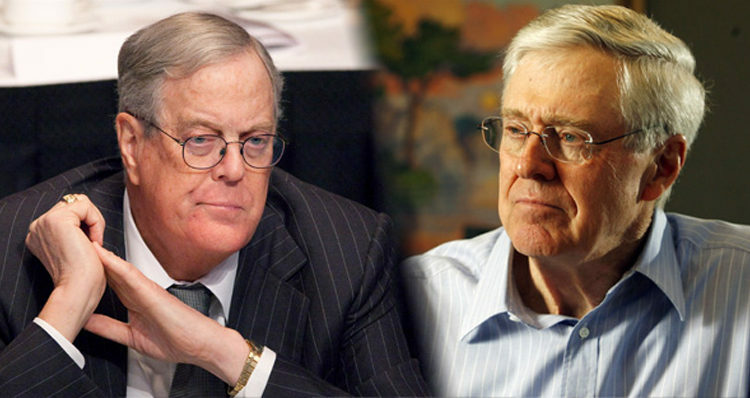 Charles and David Koch, the only two of founder Fred Koch’s four sons still with Koch Industries have an estimated combined wealth of $86 billion making them the second wealthiest family in America. At issue was the apparent lack of any political return for their massive financial investments in national electoral campaigns. Starting in 2010, the Kochs began to establish and utilize a vast constellation of nonprofit and limited-liability groups to collect and disburse many millions of dollars in contributions from their members while keeping their identities anonymous. That year, Republicans took back 63 House seats — and control of the chamber itself — in the largest midterm landslide since 1938. Two years later, the Koch network spent more than $400 million during the 2012 cycle, a figure celebrated on the right despite Mitt Romney’s lopsided loss. Undeterred, the network spent nearly $300 million on all activity for the 2014 cycle. “Charles and David had a different take on 2014 than their political lieutenants did,” says an operative with direct knowledge of the network’s internal operations. The Kochs believed that the takeover hadn’t changed a thing. No conservative policy revolution was happening in Congress. They couldn’t even stop a re-authorization of the Export-Import Bank, a symbol of Washington’s “crony capitalism.” It was just more of the same. A number of top executives and advisers from across the Koch enterprise had been invited to attend the meeting, too. They represented the so-called “corporate side” of Koch World, which had long warred with the “political side” of the empire, particularly over the consequences of the brothers’ campaign-related activities. In the end, a vote was taken and, declaring that “the majority had spoken,” Charles Koch decided to retreat from their previously announced plan to spend nearly $900 million on the 2016 campaign. In the first week of April, a decision from the top sent shock waves through Koch World: The Competitive Intelligence Team, a unit of some 30 employees tasked with conducting advanced research on liberal groups and Democratic campaigns, was unexpectedly dismantled. The CIT, which went by the dummy LLC “American Strategies Group” in public filings, was quietly established after the 2012 race, one product of the Kochs’ election autopsy. It worked under the Freedom Partners banner executing the Koch network’s long-term plans to undermine Democratic causes, campaigns, and candidates. The Kochs’ political operation has spent less than $10 million total so far on paid media in this year’s Senate contests, according to public filings; by this point in 2014, they had spent over $35 million. And in certain contests, such as the Wisconsin Senate race, Koch sources say the continued spending is aimed as much at keeping up appearances – and standing with an ally on principle – as it is on winning an election some network insiders consider out of reach. As one source puts it, the Kochs have turned off “the spigot.” If the goal is to steer their organization away from campaign and election activity, it only makes sense that they would stop granting millions of dollars to groups likely to spend on just such activity. Consider the U.S. Chamber of Commerce, a major election-year spender. Tax filings show that the Chamber received a $2 million grant from Freedom Partners in 2014. But there was no such donation in 2015. It was an off-year, of course, and one in which the Kochs feuded with the Chamber over the reauthorization of the Export-Import Bank. But sources say Freedom Partners has not given to the Chamber in 2016, either — and does not plan to, despite requests from the mighty business lobby. Another example is the National Rifle Association: According to tax filings, Freedom Partners gave $4.9 million to the NRA in 2014. But, like the Chamber, the Second Amendment champion has received nothing since. The same goes for the Club for Growth, which received $1 million from the Koch network in 2014, but has been shut out the past two years despite pleas for cash. Concerned about the damage being done to their corporate brand, increasingly bothered by their public vilification, and convinced after Republicans’ 2014 Senate takeover that even significant victories were having a negligible impact on federal policymaking, the Kochs began signaling to their closest allies that they were reevaluating their approach to politics. They had always believed that building the intellectual foundation for libertarian ideas in think tanks and universities — and supporting important public-policy initiatives at the state and local levels — paid greater long-term dividends than spending on elections. And more and more, they worried that campaigns could actually prove detrimental to their educational and advocacy work. The Kochs’ corporate associates and public-relations team had warned them their involvement in politics could sully their legacies, and now they were beginning to agree. Regarding this concern for public image, Robert Greenwald was one of the first to lead the charge against the Kochs with his explosive 2012 documentary for Brave New Films entitled: “Koch Brothers Exposed.” The film was made available to over 50 million homes via cable and satellite; Brave New Films also partnered with groups and organizations to include progressive media outlets, who screened the documentary in churches, community groups and homes throughout the country. Through this film, Greenwald was one of the first to shine light on the Koch’s involvement in U.S. politics which, in turn, contributed to the Social Media barrage on the Koch’s political involvement, such as this Facebook page of over 40,000 members promoting the documentary.